Nathan is a life-long musician and skilled guitar technician who began performing in church at the age of three. He has played in dozens of groups over the years, developing his versatility by covering musical styles from Baroque to Bang Your Head. His experience with teaching goes back to his high school days where he helped teach Vacation Bible School at church. After studying music at Sam Houston State University he became a camp counselor and program specialist at Camp Lone Star (La Grange, TX) and Camp LuWiSoMo (Wild Rose, Wisconsin) where he worked with kids aged six to sixty. Nathan later worked with Guitar Center, where he learned extensively about many aspects of musical equipment while helping to educate his customers. For the last several years Nathan has been in high demand teaching guitar, bass, saxophone, mandolin, and banjo at Kingwood Music School. 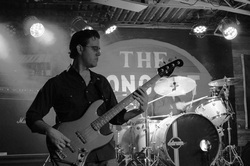 He has been performing with local rock cover bands for two decades and is currently the bass player, backup singer, and sound engineer for Nervous Rex Band and lead singer/guitar player for Nervous Rex's Duo.